I celebrated Easter Sunday today in what I hope will become tradition: feasting, reading, and watching a Top Chef marathon. No trip back east to spend the holidays with the family this year. Instead, Fondy and I contented ourselves with an exceedingly relaxed afternoon. After a late lunch of sunchoke soup, grilled prawn, lobster tails, broiled scallops, and some southern style butter-mashed molasses sweet potatoes, I finished up next week’s book of the month club selection, The Big Over Easy, and did some laundry, feeling intermittent flashes of guilt for not getting back to that Atlantis script. Ultimately, I decided to take the day off, confident in my ability to complete the draft before my self-imposed May 1st deadline. Really, at this point the key players are enroute and things should move quickly. Aside from the minor hiccups of figuring out the whys and how-to’s of reuniting our heroes, and nailing down the shifting motivation behind the big throwdown, it should be smoooooth sailing. Yep. Back at it tomorrow. So I continue to work my way through that enormous pile of comic books in my quest to find the best of the best titles that will, hopefully, restore my love of the genre. And – I have a question. Is the Ultimate line some sort of parallel universe? I mean, Wolverine is a pretty busy guy, no? Between splitting his time between both the X-Men and the Avengers, he’s also off on a multitude of solo adventures. What gives? Is there any sort of sync between these various titles? Ultimate X-Men – Written by Aron E. Coleite, Illustrated by Mark Brooks (and Dan Panosian issue #99). I’m surprised. The overwhelming glut of X-titles were what first turned me off comic books, so I was a little leery about diving back in. But, since I was casting as wide a net as possible, I decided to check out Ultimate X-Men. And came away impressed. Amid all the action, a number of nice character moments and – is this right? – deaths. Pretty gritty stuff. Ultimate Spiderman – Written by Brian Michael Bendis, Illustrated by Stuart Immonen. Didn’t love the first issue I read but liked the next couple of installments enough to put this one on the list. It reads kind of young but Bendis’s trademark humor is dead on. 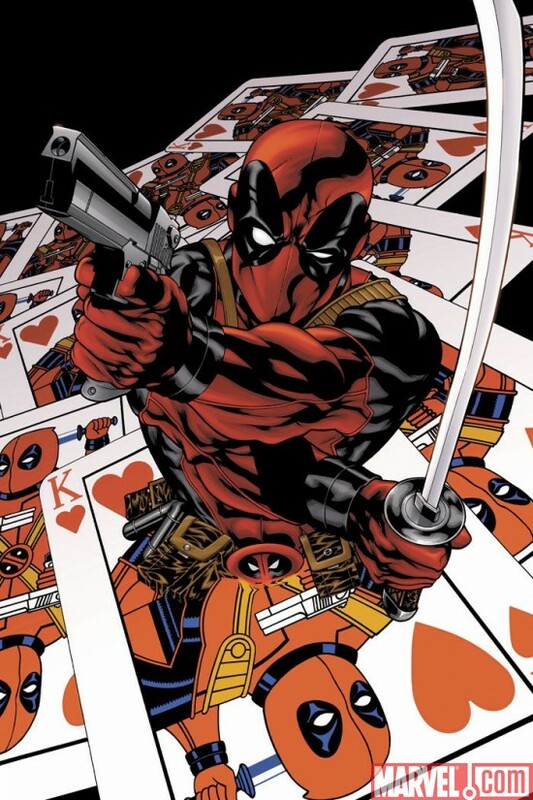 Deadpool: Suicide King – Written by Mike Benson, Illustrated by Carlo Barberi. One title I loved back in the day was Deadpool. The merc with a mouth was at his very best under the guidance of veteran writer Joe Kelly who spun some of the most delightfully dark humored adventures I’ve ever had the pleasure to enjoy. In this limited series, Mike Benson does a nice job of picking up the torch while Carlo Barberi’s pencils add chaotically comical layer to the proceedings. So far, so good. 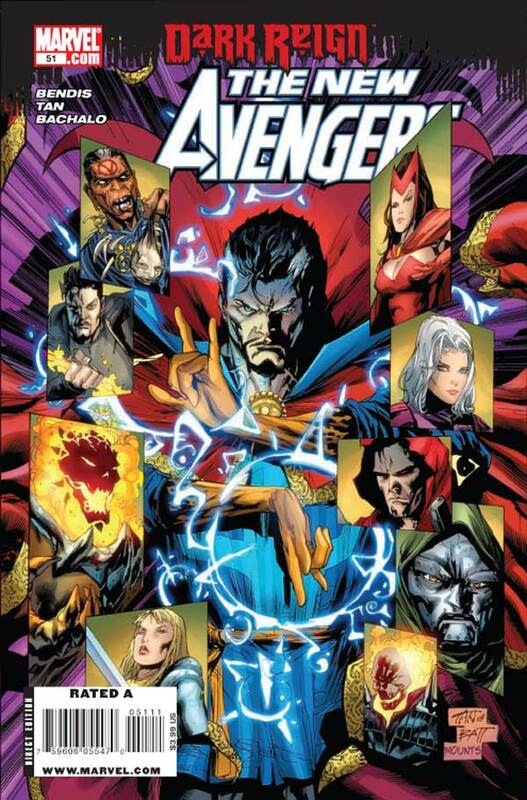 The New Avengers – Script by Brian Michael Bendis, Art by Billy Tan, Matt Banning and Justin Ponsor & Chris Bachalo, Tim Townsend and Antonio Fabela. Hmmm. Hmmmmmmmmm. Hmmmmmmmmmmmmmmmmmmmmmmmmmmm. I’ve never been a fan of the magical storylines and, call me a traditionalist, but I’ve always considered Spiderman a loner and not at all a team player. And what is Wolverine doing on the team? Is there more than one incarnation of The Avengers? Scrambling to play catch-up on Dr. Strange, Norman Osborn, H.A.M.M.E.R., the Skrull Invasion (Skrulls, by the way, rank right up there with magical storylines and anything to do with the Infinity Gauntlet and/or gems), and the Scarlet Witch. Yeah, a little overwhelming. Still, as in most of Bendis’s work, the characters – particularly in their quiet moments – really shine. On the fence for now. Previous Article April 11, 2009: Handing Off, News You Need to Know, and Brie Goes Berserk! The ‘Ultimate’ titles have no tie-in to the regular Marvel 616 universe. (Well, I can’t recall any Ultimate/616 cross-overs off the top of my head). Ultimate was meant to be a starting point for new comic readers so they didn’t have to deal with all the past history of the Marvel-verse. Your Easter sounds more relaxing than my Easter. We woke up, went to church, came home, ate breakfast, put gas in the car, ate lunch, then I pressure-washed the house, sidewalk, and gutters. All in all it was pretty fun (I love the power the pressure-washer gives me – I can blast the skin off my enemies! Muahahaha*cough*). And a quick comment about your last post – Brie is adorable. “Is the Ultimate line some sort of parallel universe?” – Something like that. A lot of us consider it an alternate universe of sorts. LOVE Deadpool. He’s been one of my favorites. I haven’t read Suicide King yet, can’t wait to get my hands on it! Ultimate X is an alternate universe version. At one point Beast died then came back, Wolverine slept with Jean early on in the series, Peter (Collosus) is gay and used to work for the Russian Mafia. Wolverine started out working for Magneto and was hired to kill professor X but changed sides. Professor X dies at one point. Magneta has a floating “cloud city” hideout. Kitty Pride is a spoilt rich kid sent to Proffessor X to be given guidance and becomes Spiderman’s girlfriend. Storm and Beast are a couple – or were. 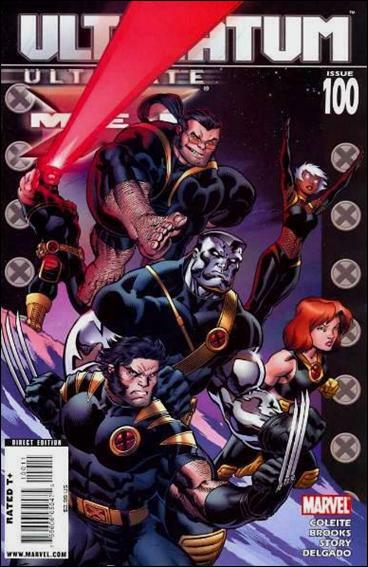 I really was enjoying the Ultimate Xmen, until the comic book stores I know of here stop selling them. It appears that you are having trouble getting up enthusiasm for the Atlantis script and this disappoints me greatly. It appears that Atlantis is barely on the radar for the powers that be and I think it’s been so for some time. I know what you’ve said on the subject and I believe you. But if this movie gets made, I will be totally surprised. I slept the bulk of the day away, so I claim to be lazier than you. And while I normally approve of sloth, especially on special occasions(like any day of the week ending in the letter “y”), I must admit your inclination to wait till Tuesday to getting back into harness. . Just think of the ongoing psychic trauma we Atlantis fans have suffered. Every time you indicate the slightest hiccup in the ongoing progress on the movie, you are sending hundreds, perhaps thousands into cardiac arythmias, possibly fatal ones. So please, torture us no more. Somehow, someway we’ll make it worth your way. (promise subject to too many conditions to be listed here). Glad you enjoyed your day, and hope the week is both productive and fun for you. which season of top chef? btw, do you have a favorite Top Chef competitor? Is the Ultimate line some sort of parallel universe? I believe it is. I’m sure you can google to find out more. 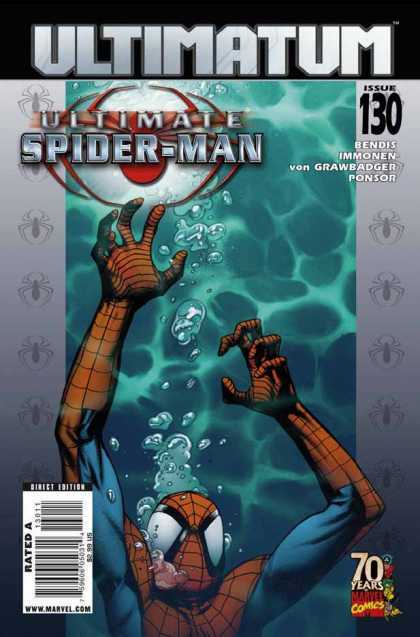 Personally, I can’t stand the Ultimate universe. Sure, I haven’t given it a fair shot exactly, but the way they’ve messed around with the characters put me off it so much I just don’t want to read it. Not the least of these changes is Beast’s more animalistic look. I know, in the grand scheme of things, that’s not a big deal, but it grates at me every time I look at him with a muzzle instead of a face. As much as I love AUs, you might think I’d dive right into the Ultimate comics, but what bothers me about them is how they sometimes seem to be taking over, like with how the latest X-Men movie appeared to be based more on the Ultimate comics than the story that’s been around for decades. If the Ultimate universe goes away and the 616 universe stops being shunted to the back, I may give the Ultimate stuff a second look. I now have pink eye. The more I think about it, the more this reminds me of an on-going illness I had back in 1992. Same exact thing was happening to me – get rid of one thing and come down with another (only with that one I didn’t have pneumonia). And before that, I had a recurring strep infection that lasted a good part of the beginning of 1980. In between, I’m usually pretty healthy. So, here’s what I think: every 12-17 years, my immune system throws a hissy fit and knocks me down. Now…just gotta figure out what triggers it (stress, most likely). Watched Twilgiht tonight. Didn’t love it or hate it…but we did enjoy it enough. Actually, I think my husband enjoyed it more, since he was the one urging them to kiss, while I was the one wondering when the fighting would start. Anyway…Joe (put that in bold because I figure it’s the only way to get your attention)…there was one thing that happened in the film that I wish had been done on SGA. When one of the vampires who has only recently given up feeding on humans meets the girl, his reaction is amusing…you can tell he’d much rather bite her than greet her. Wraith, on the other hand, are always so stoic and reserved when they have to play nice with their food. Just once I would have loved it if Todd had to slap Kenny upside the head, scolding him to stop ‘salivating’ over the humans. I’ve already said too much tonight, so won’t go into why that sort of thing works for me…but it has to do with those little glimpses into what’s on someone’s mind…which I usually find more interesting than what they really say. “nailing down the shifting motivation behind the big throwdown – see, it’s stuff like this that makes me worry. Mmmmmm yeah i’m gonna need that sweet potato recipe. It’s making me hungry…. please???? I slept through breakfast at my church this morning, then managed to sleep through most of the afternoon as well… finally getting up to go sit down for two hours and watch a movie with my friends–Stargate: Continuum, as a matter of fact. The two who were familiar with the universe enjoyed it immensely; the one who wasn’t still got a bunch of laughs out of it! Having already seen it like 25 times, it was hard for me not to point out the little things I learned from the commentaries! I came back from the movie to sit in front of my TV and watch the NCIS marathon on USA. I swear, that channel can read my mind… they only ever show repeats of shows I like! And now I’m lounging in front of my laptop reading the blog entries I missed while I was being lazy today. So, yup, it’s been a lazy day all around methinks. Which means tomorrow’s gonna be the first of hell week, but at least today was nice and chill. Heh…I forgot Wolverine: First Class – which is a sort of retro book exploring the adventures of Kitty Pryde and Wolverine back when he was training her to be an X-Man. This is a totally stand-alone book, and fairly mild. Which is interesting…is Stargate Universe going to produce products from whatever galaxy the Destiny ends up in to sell on Earth? hey so the full opening credit sequence will be featured in every episode of season five right? they wont have that quick stargate atlantis flash an then back to the episode? Sounds like a well-spent Easter to me. Beats spending it with my crazy relatives!! A special thanks to my niece Heather for finding this. Thought maybe other John Cleese fans would enjoy! As the others have said, Ultimate is definitely an alternate universe. The one major change I can think of (haven’t read a whole lot of either, but I have a few runs in my closet I have to go through) is that Nick Fury looks an awful like Samuel L. Jackson. And this change was made well before Iron Man, so I’m guessing the current Marvel movies are loosely based on the Ultimate universe, as shown by Mr. Jackson being in Iron Man. Hope you have a great day. Can’t wait for the next post. some Other families and we hung out and ate. Hope everyone else had a happy easter! Even after all the announcements you still doubt the movie being made. Seriously, why do you think Joe and Paul(or at least Paul, lol, sorry Joe, I just had to say that) are putting in the effort to write a feature. Besides, the movie has been green lit and the sets are still standing. So why so doubtful? I’m a new blog reader here but I wanted to say thank you for the VD of Brie. My husband and I had a good laugh watching her think her way through the hedge problem. @ MaryD – Saw Vincent! That’s really cool…and Vincent is quite lovely (as are all Wraith…well…except those masked suckers. Even their own kind don’t wanna look at their faces!). Sounds like you had a great Easter. I spent it at my sister’s. Allie, once again, became the human jungle gym for my 7 nephews while Erin cried a lot. She’s a girly-girl in a very boy-filled family. Poor thing. Plus Jeremy now has a massive sinus infection so he wasn’t there to help beat down the nephews and rescue Erin. Good times. But my mom brought her new puppy. A redish-blonde toy (maybe a teacup?) poodle named Rachel. She’s adorable! She took on my sister’s Great Dane. I think Rachel won. At least Rachel thinks so. @Rose: They still have the Atlantis sets up. If the movie was for sure not going to be made those sets would already be gone. You can’t do a thing about the movie without a script (so please hurry Joe! ). But you don’t have to believe me, Joe or Major D. Davis. I’m fully confident that time will prove us right and we’ll get our movie. @Deni B: I think your father and my grandmother would have gotten along famously. It’s weird the things our loved ones let fly outta their mouths, right? I guess I’m in good company, then.